Beautifully engraved Specimen certificate from the American Steel Casting Company datd 189_. 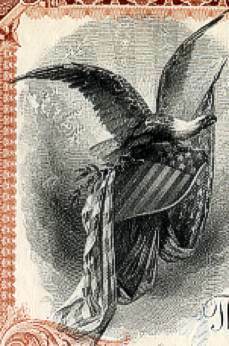 This historic document was printed by American Bank Note and has an ornate border around it with a vignette of a bald eagle holding a shield and United States flag. The certificate has a small cut in the upper center white border as shown in the scan, otherwise EF. This is the first time we have had this certificate for sale. The Standard Steel Casting Company, commonly referred to as Thurlow Works, was a steel production and steel casting facility founded in Chester, Pennsylvania in 1883 by shipbuilder John Roach. The company was established primarily to supply steel ingots for Roach's steel mills, which included the Chester Rolling Mill and the Combination Steel and Iron Company, although it also manufactured steel castings. Standard Steel was the first company in the United States to manufacture commercial quantities of steel utilizing the acid open hearth process. Roach relinquished majority ownership of the company in 1884 to Robert Wetherill. In subsequent years, Thurlow Works made a name for itself as a manufacturer of large steel castings, especially for the railroad industry. America's first cast steel locomotive frames were poured at Thurlow in 1893. The Standard Steel Casting Company was merged with several other steel casting companies in 1892 to become the American Steel Casting Company. 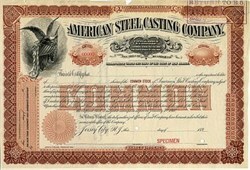 The American Steel Casting Company was itself merged some years later to form one of America's largest steel companies, American Steel Foundries.